Monopoly is themed on the hugely popular board game of the same name, designed to give you a taste of high life. It is a 5 reel 9 line slot game. 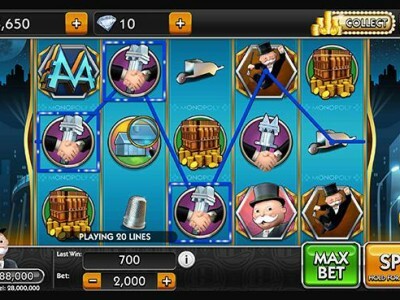 Five reels mean there are 5 spinning reels to choose your winning combination from, and 9 lines mean that there are nine times more chances to get rich rewards. With some luck you can also qualify for either of the two excellent bonuses: the Community Chest Bonus Feature and the Pass Go Bonus Feature. Monopoly can be played in coin denominations of $0.01 up to $5 and wagers of 1 to 5 coins per payline. The maximum payout in the regular game is 25,000 credits. Mr. Monopoly is the wild symbol in the game meaning that it can replace all other symbols, except the scatter and the bonus symbols, to complete winning combinations. On the other hand, the Community Chest Bonus Symbol is the scatter symbol that triggers the Community Chest Bonus game. Similarly, the Bonus Dice symbol initiates the Pass Go feature. The Community Chest Bonus Feature is activated when you get the Community Chest Bonus Symbol anywhere on the last three reels. In it you click one of the animating bonus symbols to find out your Bonus Multiplier. The award is calculated by multiplying your total bet by this multiplier. On the other hand, The Pass Go Feature is activated when you get three Bonus Dice symbols on an active payline. In it you select one of the three animating Bonus Dice symbols to find out the number of times you are going to roll the dice. 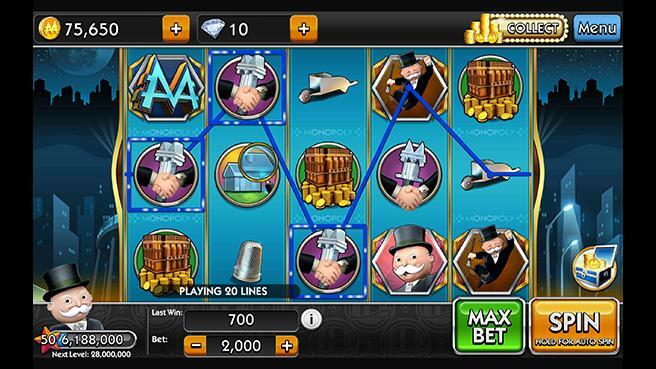 With so many interesting features packed, the Monopoly slot is definitely worth a try.